2017 is here and you’ve made a promise to make this your best year yet. This is the year that you’ve decided to leave all of your fears behind, and totally go for it. You want to live the life of your dreams, and the best way to start is by getting promoted at work. You already understand that as a woman, moving up the corporate ladder can be hard, but you must realize that it’s not impossible. Here are a few tips to guide you along the way! Going for a promotion in a male-dominated work force is no walk in the park. There are going to be days when you feel like throwing in the towel, but you must develop a “can’t stop, won’t stop” attitude. A positive mindset is the only thing that’s going to pull you out of the gutter on those rough days. Get into the habit of using mantras or daily affirmations to reassure yourself. When you affirm something, you are declaring it to be true. Repeatedly stating phrases like “I am enough” or “I possess the qualities needed to be extremely successful” will definitely give your confidence a boost when you need it. Put these and other mentally stimulating phrases on post-it notes around your office and home to constantly remind yourself how awesome you are! No one will know that you want to move up in the company unless you say it. Don’t make the assumption that your hard work will be noticed and you will be automatically granted clearance to move up. Let your boss know that you are seeking to be promoted, then get to work. Uncover your weaknesses, then start to look for ways to improve. Broaden your horizons by taking on more projects. Establish yourself as a leader by working on your critical thinking and problem-solving skills. Remember to showcase what sets you apart, but always remain a team player by keeping the interests of the company first. You may need to get comfortable with being the first one on the job in the morning and the last one to leave at night. Simply put, it’s time to hustle. When you make your intentions known to your boss, then back it up with action it’s nearly impossible to go unnoticed! More often than not, women tend to play the background in their career. While men bask in recognition, warranted or not, women seem to take a more modest position, even if they did the bulk of the work. If you want to be taken seriously and move up in the company, you must be vocal! Do not dull your light in fear of what others might say or think about you. Take pride in your accomplishments and accept all the accolades that come with it. You earned it! Not only is playing small the fastest way to get looked over, it’s absolutely soul crushing. To quote Marianne Williamson, “There is nothing enlightened about shrinking so that other people won’t feel insecure about you”. You are great. The effort you put into your career is phenomenal. Own it. You’ve made it clear to yourself that you really want to make 2017 different from the rest. Now it’s time to let others in on your goal. Allow yourself to shine so brightly that no one can deny your light. That promotion is already yours, it’s just up to you to go get it. Be fearless, and if you get knocked down on the climb, just get up, shake it off, and keep on moving. Gloria Martinez is a college professor turned business owner who created WomenLed.org to educate people about the many women-led achievements that have shaped our world. 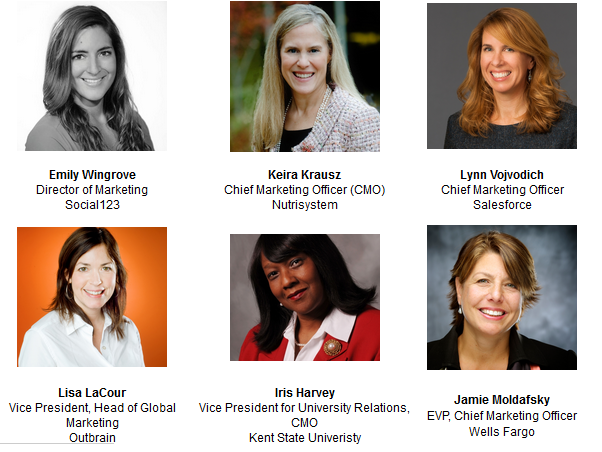 Honorees Announced for the 2016 Marketing Hall of Femme! 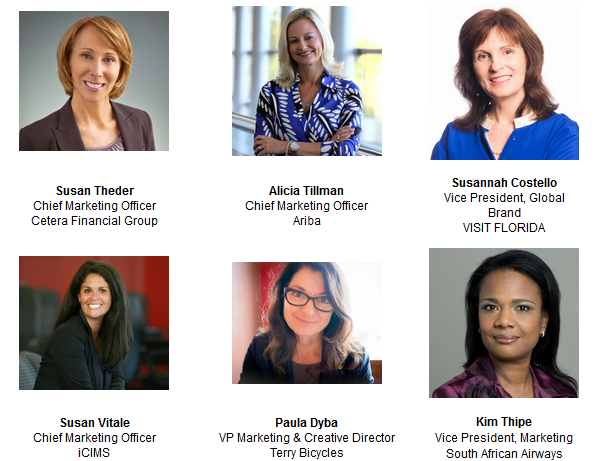 Direct Marketing News is honored to announce the 2016 Honorees to the Marketing Hall of Femme! 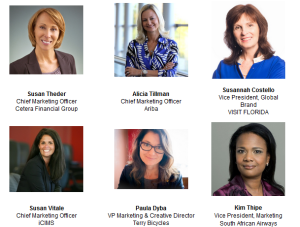 These incredible women have storied careers, take risks, and push the industry and their companies forward with their edgy marketing strategies. On April 8, 2016, we’re celebrating all of their outstanding achievements and more. New this year, the event features a Leadership Summit in addition to the Awards Luncheon. 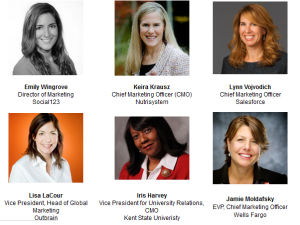 Attendees will meet the 2016 Leading Ladies, hear the first-person narratives behind their success stories, and attend educational sessions that explore the challenging yet rewarding roles of female leaders in the marketing industry today. Click here to read about previous years’ honorees and keynote speakers, view video interviews, and more. My POV: Of course it would be to say that we need more women in technology. That’s it. I will keep it simple. And to congratulation all the amazing women named here and that work in the world of technology every day! You are my heros. “The new site focused on global travel and culture, will capture ideas from untold and told travel stories for the discerning and well-traveled globetrotter who has already been to many of the most popular destinations in the world. Products: The Products section will cover in-depth reviews as short pieces on products writers discover that will help travelers on and off-the-road. Travel products can range from clothing, bags and shoes to camera equipment, mobile devices and mobile apps, net books, laptops and social media apps that focus on food and wine or help travelers navigate their way to and around a new destination. LIFE: We Blog the World explores the human side of travel, from storytelling, human interest stories and unique experiences that shape the world today. Inspirational and life-changing stories will be told in the LIFE section through feature stories and a Q&A format. The site incorporates a community of independent voices from around the world who discover remarkable people and experiences and then share their unique perspective with readers. Food & Wine: For foodies and wine lovers, We Blog the World will continue to run fun and creative stories about food and wine, including events and festivals. Content will come in the form of restaurant reviews, farm-to-table experiences, interviews with chefs, unique recipes and food photography. Lodging and Spas/Retreats: The new We Blog the World will expand its global coverage of hotels, lodging, and resorts and has added a new section dedicated to retreats and spas. Independent voices will bring a human side to travel accommodation which may include an inside peak at the people who own the hotel or resort or those who make it tick. Style: The Fashion section has been merged with the new Style section, which will not only include creative and interesting fashion from different cultures around the world, but also style, which includes great design of products, places and things. We Blog the World, the Globe Voice for Travel and Events, is an online culture and travel magazine focused on unique cultural events and travel experiences for the discerning, well-traveled globetrotter. Dedicated to the human side of travel, We Blog the World captures stories, experiences and visual highlights from every continent in the world through a community of independent voices. For more insights, stories and tips on global travel and international culture, follow We Blog the World on Facebook at http://www.facebook.com/weblogtheworld, Twitter @weblogtheworld, on YouTube and on Pinterest at: http://www.pinterest.com/weblogtheworld. I have and will also be writing posts for the site! We Blog the World relaunching today!